It’s human nature to question, search, & try to connect with something greater than our Selves… call it God, Mother Earth, Great Spirit, or whatever you choose. We want to know our existence has meaning. I’m lucky to live in a time & place where I can freely search for meaning in my own life. For “Reclaiming the Divine”, one of my recent works, I reflected on the earliest religions from around the world, religions that were centered around a female deity, represented by the figure in the middle of my collage shown below. Ancient people represented the Goddess in a variety of ways from voluptuous earth mother to more birdlike female forms. They also represented themselves by including human figures or handprints in cave paintings. I, too, used my handprint to symbolize the intimate relationship between the individual & the Divine. 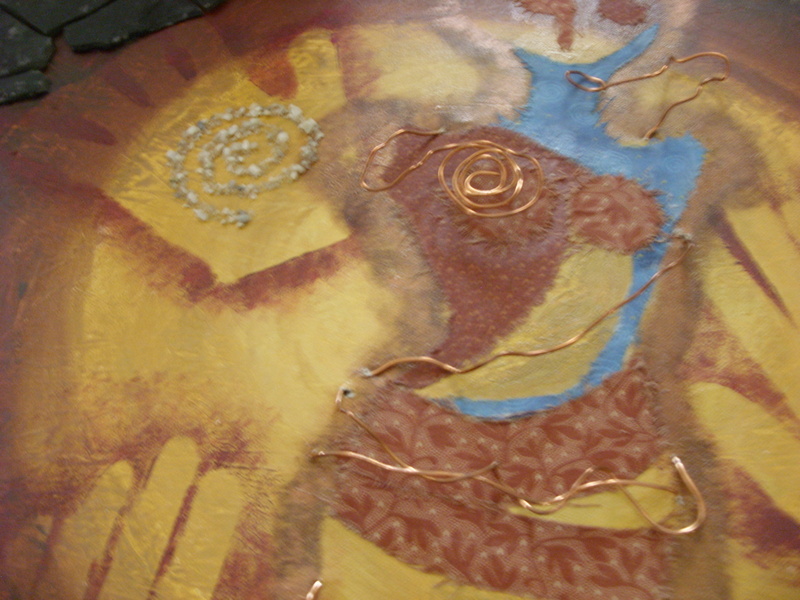 However, I put a modern twist on it by including locally found materials and by twisting copper wire around the figure so it appears to rise off the canvas. Reflecting on ancient beliefs led me to ask questions like… What connects us all? What do all human beings have in common? I conclude that each of us laughs, smiles, loves, & wants to be loved. That’s why connection has such a place of prominence in my art– connection to the earth, the Divine, & one another. If you have been reading my blogs, you may have noticed a common thread tying them together in a beautiful tapestry that is my personal mantra… Everything is connected. What we do affects the earth. What we do affects each other. I saw a documentary recently in which a female writer & activist said that if we realized our actions affected everything else, we’d act differently. We’d see that what we do is of great importance. I hope you feel a connection to something greater than your Self– something formed of love, peace, & light. Reclaiming the Divine: Everything is connected. 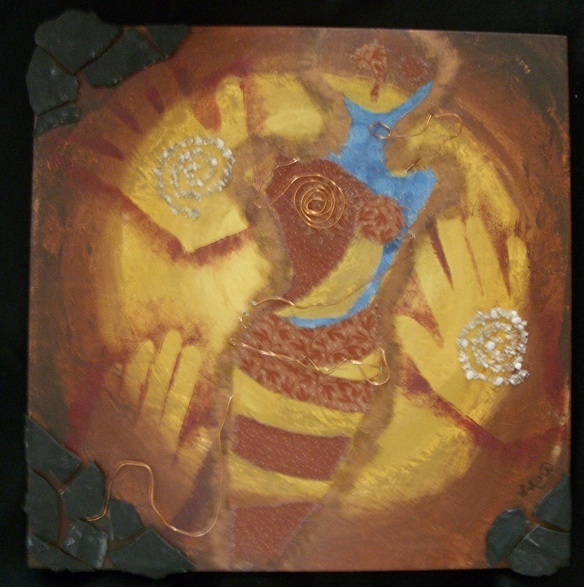 This entry was posted in A Window on Life, Art and Soul and tagged art, collage, connection, divine, earth, goddess, life, love, relationships, spirituality by puresusan. Bookmark the permalink.